Apple's progress in 3D sensing design and mass production is 1.5 to 2 years ahead of Qualcomm's, according to a new investor's note released today by KGI Securities analyst Ming-Chi Kuo. Kuo believes that Qualcomm is behind in both software and hardware development for 3D sensing, and won't be able to ship the technology until 2019. As Qualcomm is the "most engaged" company when it comes to 3D sensing components for Android devices, Android smartphones could lag behind Apple devices for some time. While Qualcomm has excelled in designing advanced application processors and baseband solutions, it lags behind in other crucial aspects of smartphone applications like dual-camera (many Android phones have instead adopted solutions used to simulate optical zoom from third-party vendors such as Arcsoft (US)) and ultrasonic fingerprint scanner (while a new reference design has been released, there is no visibility on mass production). So while Qualcomm is the most engaged company in the R&D of 3D sensing for the Android camp, we are conservative as regards progress toward significant shipments and don't see it happening until 2019F. In general, Kuo says the "Android camp" appears to be taking a wait-and-see approach to 3D sensing, which also does not bode well for Qualcomm's 3D sensing technology. Android manufacturers are said to be waiting to see how Apple will use 3D sensing and whether it will offer an "innovative user experience" with features like facial recognition. Xiaomi's 2018 flagship device is said to be the only potential adopter of Qualcomm's 3D sensing technology, and if the OLED iPhone doesn't see positive feedback following launch, Kuo believes Xiaomi may drop the project. Apple is rumored to be introducing a front-facing camera with 3D sensing functionality that will enable a new facial recognition system to replace Touch ID, which the company could not build under the display of the device due to production issues. Apple's "iPhone 8" with 3D sensors is expected to debut in just a couple of weeks. Same story as Touch ID: the competition is behind. But then again, Apple is behind in a lot of stuff as well. In other words: Competition is great. It's going to be great. Once we get Face ID, we won't be looking back. I'm sure Samsung is not behind.... they will have it next year although they were first to introduce some type of facial detection anyways. I still feel Iris scanning is more secure in combo with fingerprint reader. Why would you think Samsung isn't behind when just a few years ago, Apple leapfrogged everyone's fingerprint sensors by 2-3 years. Just because a crude form of face detection is available today, doesn't mean they have a secure, user-friendly, reliable version right around the corner. I'm not saying you're wrong since no one knows for sure, but your logic is definitely flawed... especially since Samsung has a poor track record with security; their iris scanner was recently hacked, for example, and their face detection was hacked almost immediately. Until we get BackID and then we’ll have to do that. I’m still not convinced this will replace Touch ID, and I haven’t seen this question asked. How the hells am I supposed to use this feature when it’s pitched black in my room at night? Really? You haven't seen that question asked? It's probably the most-asked question about FaceID here on MR. But to answer your question: infrared. Doesn't matter how pitch black it is, infrared will be able to detect your face. Some smartphones/laptops already have this I believe. ..and ugly. they're really trying to hold onto the white front as long as they can. 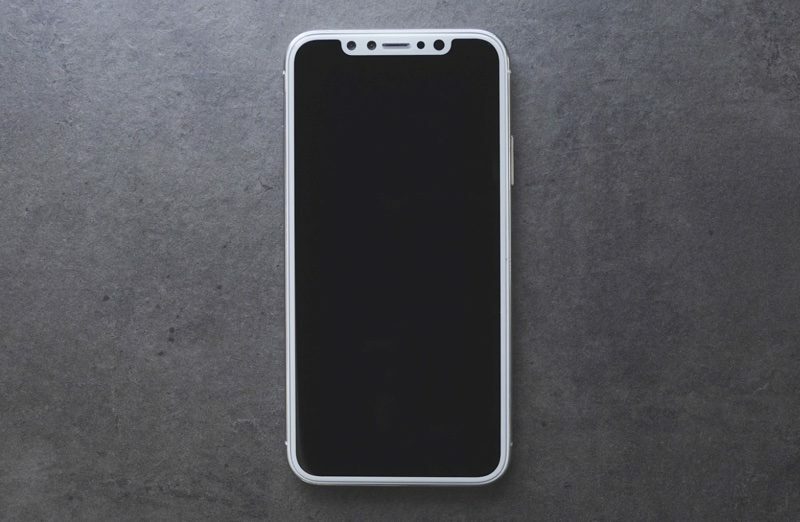 IMO I think it would make the screen appear smaller than the black front if this holds true to be the next iPhone. Exactly what I have been thinking: OLED favors black and provides energy efficiency, yet all these leaks show Apple hanging onto very bright white iPhone display backgrounds in Safari. I only hope that Smart Invert works better than beta, because I want the 8 for OLED black - pls save my eyes. lol but seriously. By definition, infrared light is invisible to human eye. That's why it's called "Infra" (lower-than) "red". So no it won't be visible to you even in the dark. You shouldn't think of it in terms of a "night vision camera", it will more than likely won't work like that. Everything points to the FaceID tech being equivalent to a miniaturized Kinect. Apple bought PrimeSense (makers of the first Xbox Kinect) several years ago, and the HomePod firmware contains references to an IR projector. The Kinect works by projecting an infrared pattern of seemingly random dots. An infrared camera captures an image of the projected dot pattern, which is deformed by the shape of the object(s) it's projected on. An algorithm then analyzes the deformations vs. the expected pattern and recreates a depth map where each point has a depth value. So FaceID will likely work by analyzing your face topology, which should work exactly the same in the dark. I will be interesting to see how much of your face it needs to have a clear shot of to work. Clothing covering part of your face. Hair covering part of your face. Various types of glasses/sun glasses. Facial jewelry being there or not. Of course it won't work at all if you have some kind of halloween costume / makeup on. Going to be interesting to see. Lax enough not to be a pain and keep rejecting things YOU do. Yet secure enough to not pass someone/something that looks like you. That's a tricky combination to pull off. Sorry to be the bearer of bad news, Sony had working products over 6 months ago in this field. Kinda bummed about Touch ID potentially not being in the iPhone 8 but if they're 2 years ahead in 3D sensing technology, then I can't wait to see what the future holds. I hope we are surprised but if they ditch TouchID for facial recognition this has the marks of corporate failure because they lacked the discipline to say "it's not ready" but feel pressure from other vendors with full screens. I hope I am wrong but increasingly Apple - which used to already like flash sometimes over substance is going way way overboard on flash over substance. So KGI Securities analyst Ming-Chi Kuo is one of them trying to bring QC down.